Every human-powered vehicle must stand the test of traveling on asphalt, through mud, and into the Merrimack River. A mud zone stymies even some of the most creative contraptions. 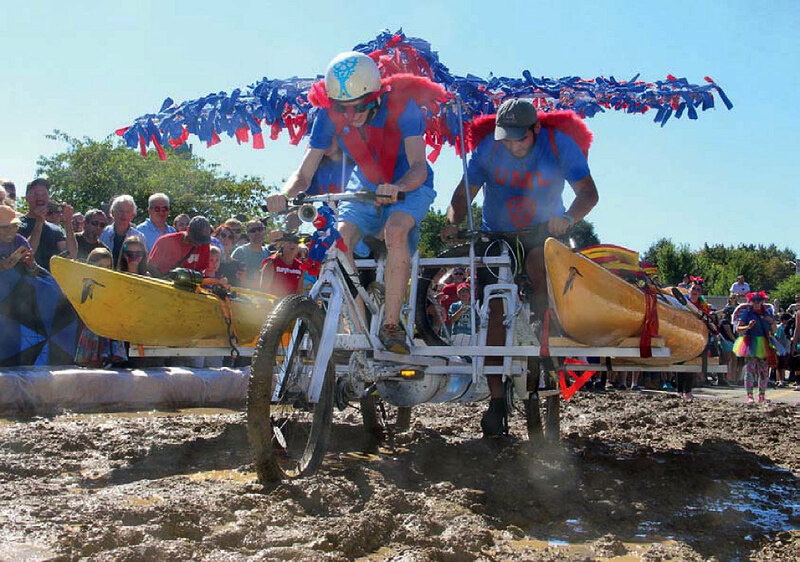 On September 22, about 20 teams will gather to propel their human-powered machines—without their feet ever touching the ground—through downtown streets and a 50-foot mud pit, and then into the Merrimack River, before returning to land to cross the finish line near the Lowell Heritage State Park. 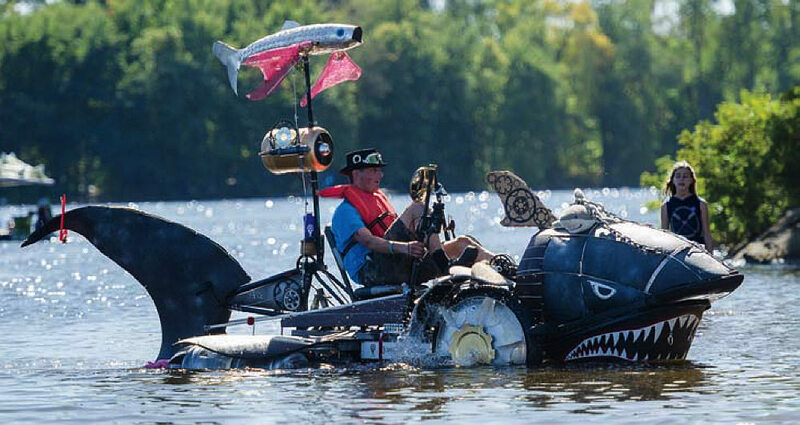 Fun and ingenuity are prized over winning, says race co-producer and artist Michael Roundy, a studio art professor at the University of Massachusetts, Lowell—and the contest supports the national STEM/STEAM educational initiative. The creations utilize all of that knowledge—the physics and mechanics involved in knowing “how to make your way through mud, how to float, how steering works,” he says—along with hands-on skills and artistry, as in welding and carpentry. A record 5,000 spectators turned out, many in funky hats, make-up, and costumes, from hot dogs and queens to Vikings and superheroes. The festivities begin at 8:30 a.m. on Market Street—where anyone can meet the teams and see their machines—and end around 4 p.m. with an award ceremony (there’s even one for the next-to-last finisher) at the park. But throughout the day, there are live bands and street performers, along with family-friendly games and food trucks.